Rose Water Hydrator combines the benefits of Herbal Extracts, Vitamins and Essential Oils. May be used for Rosacea care, to plump fine lines and wrinkles, or add a treatment to Frownies Anti-Wrinkle Facial Patches or Eye Gels. 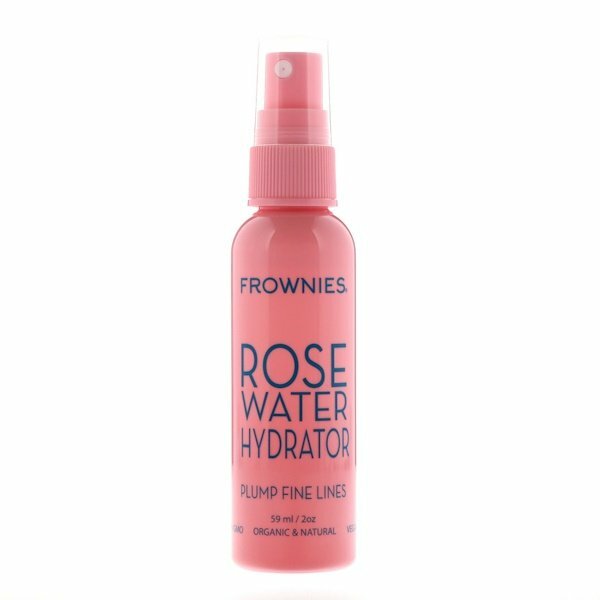 Lightly spray the shiny side of Frownies Facial Patches to activate adhesive before application; you may also, mist directly onto face, neck and décolletage as desired to refresh and tone clean skin. Aqua, organic rose hydrosol (rose flower extract), organic aloe barbadensis (aloe vera), propanediol, populus tremuloides (aspen bark), sodium hyaluronate, mixed tocopherols (vitamin E), aniba rosaeodora (rose wood) oil, rosa damascena flower oil, carthamus tinctorius (safflower) oil, citrus reticulata (tangerine). 100% Therapeutic grade essential oils.